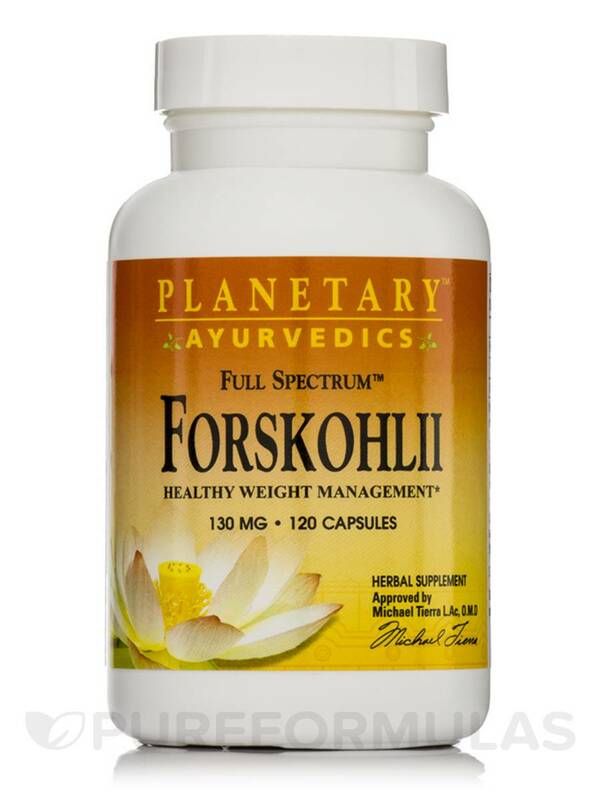 Planetary Ayurvedics Full Spectrum™ Forskohlii is a premier Ayurvedic herb used for centuries throughout India. Its primary active compound‚ forskolin (ForsLean®)‚ works mainly through direct stimulation of cyclic AMP production. Cyclic AMP is a cellular messenger that determines how cells react to hormonal signals. 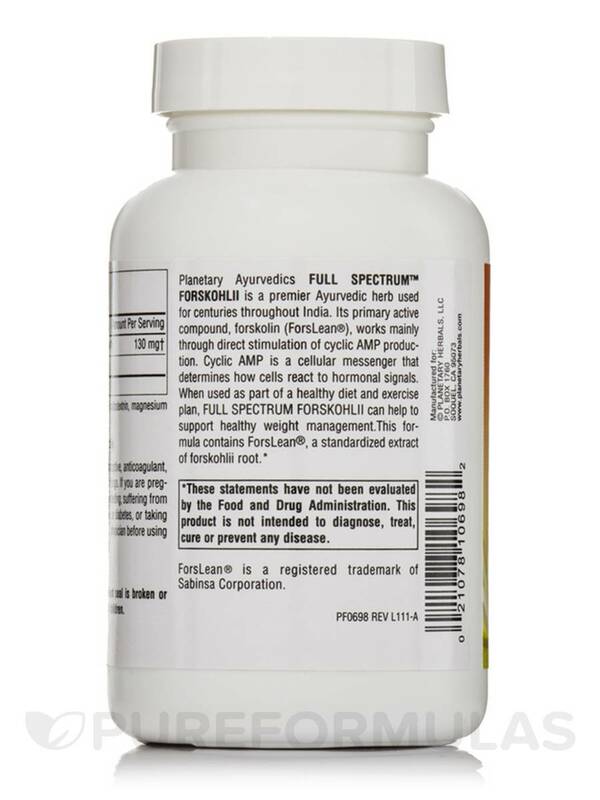 When used as part of a healthy diet and exercise plan‚ Full Spectrum™ Forskohlii can help to support healthy weight management. 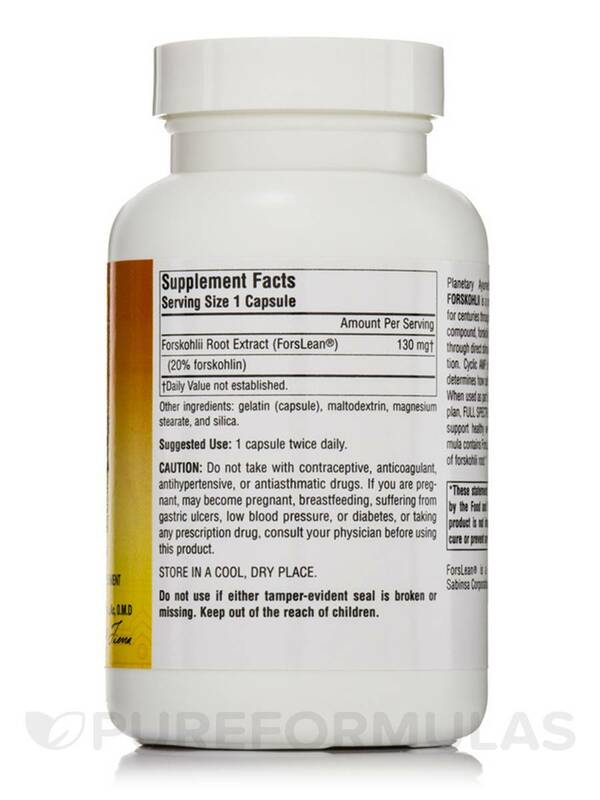 This formula contains ForsLean®‚ a standardized extract of forskohlii root. Gelatin (capsule)‚ maltodextrin‚ magnesium stearate‚ and silica. Do not take with contraceptive‚ anticoagulant‚ antihypertensive‚ or antiasthmatic drugs. If you are pregnant‚ may become pregnant‚ breastfeeding‚ suffering from gastric ulcers‚ low blood pressure‚ or diabetes‚ or taking any prescription drug‚ consult your physician before using this product. Its not a cure and I still have a flare ups here and there. But when I miss out of taking this I can feel my body reacting. I start to feel that little pin prick on my skin and then an itch and eventually a red spot starts to form. I was off of forskolin for a week and I could tell the redness was coming back. Finally re-ordered and started taking it again (along with a whole other cocktail of supplements Ive been taking) and some spots have actually started to lighten up. My skin seems to be responding to the corticosteroid ointment again.